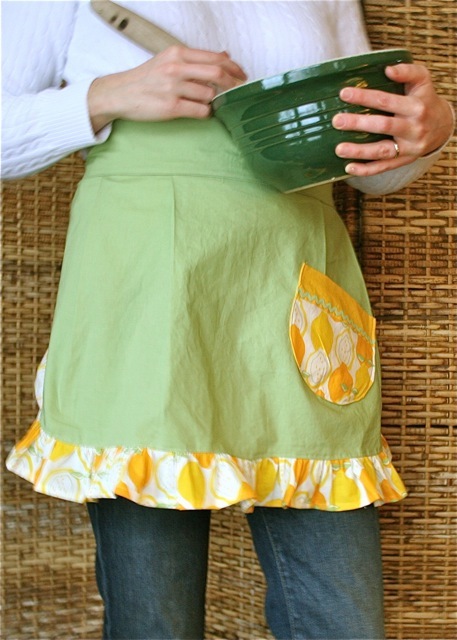 Later today, I will choose a winner for the owl pattern, but for now, remember this apron? It was featured on Whip Up a couple of weeks ago and I wanted to post it here in case you missed it. Enjoy! The kids and I have been baking cookies and bread together quite a bit these days. Honestly, I am not much of a baker and especially not with my 3 kids under 6! But, the weather has been so dreary and cold, we have been in need of something special like homemade cookies. Part of our routine has been wearing our cute aprons. It has added extra fun and kids love ALL types of dress up, right? My kids have cute aprons that were gifts or part of sets, but I have been wearing some silly thin gathered waist apron (now I admit I have some of my grandma's super cool vintage aprons but I'm not wearing those!) that has been making me feel really frumpy and not at all like the patient sweet mama who is trying to bake cookies with her fighting children with a smile on my face! This gave me an awesome opportunity to sew up a new apron just for me! 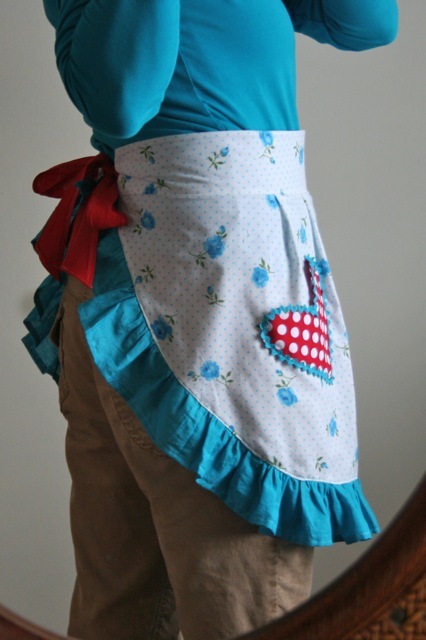 Because we all know that sewing and wearing a cute apron will insure that you never yell at your children for spilling flour all over the kitchen, right? I wanted it to be fun and flirty but also flattering. Seriously, I've had 3 babies and the whole tiny waistband and gathered skirt was not working for me. 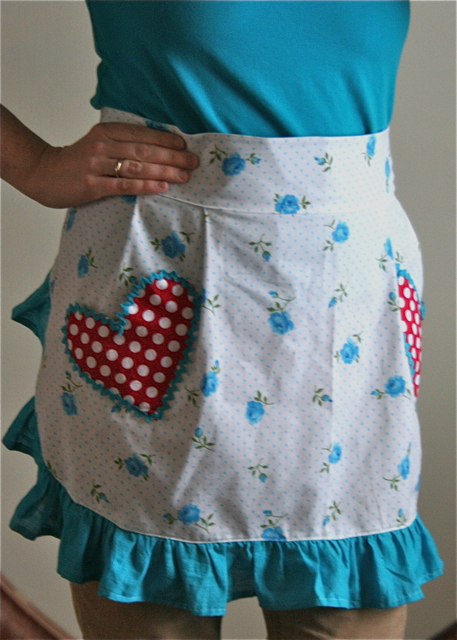 This apron has a wide waistband with interfacing to give lots of structure. It makes me feel all 50s cute even when I've been wearing my pajama bottoms all day. I also designed it using my own measurements so that it was a flattering length and the waistband came all the way around the back. Love it! So cute and sassy – I love the heart pockets! That is soo cute my apron is more like a coverall. I am a very messy cook! Thank you for the pattern! this is adorable!! So! I love your idea and demo of making it non-gathered. I am totally loving this. But I was wondering … I am looking for exactly like this but with a bib. Do you think I could just add a bib to this pattern? Or would that not work?